In E. B. 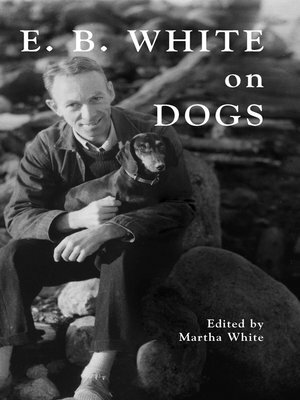 White on Dogs, his granddaughter and manager of his literary estate, Martha White, has compiled the best and funniest of his essays, poems, letters, and sketches depicting over a dozen of White's various canine companions. Featured here are favorite essays such as 'Two Letters, Both Open,' where White takes on the Internal Revenue Service, and also 'Bedfellows,' with its 'fraudulent reports'; from White's ignoble old dachshund, Fred. ('I just saw an eagle go by. It was carrying a baby.') From The New Yorker's 'The Talk of the Town' are some little-known Notes and Comment pieces covering dog shows, sled dog races, and the trials and tribulations of city canines, chief among them a Scotty called Daisy who was kicked out of Schrafft's, arrested, and later run down by a Yellow Cab, prompting The New Yorker to run her 'Obituary.' Some previously unpublished photographs from the E. B. White Estate show the family dogs, from the first collie, to various labs, Scotties, dachshunds, half-breeds, and mutts, all well-loved. This is a book for readers and writers who recognize a good sentence and a masterful turn of a phrase; for E. B. White fans looking for more from their favorite author; and for dog lovers who may not have discovered the wit, style, and compassion of this most distinguished of American essayists.